The field of pain research and theory has suddenly come alive~full of new concepts and therapeutic approaches. No one in this century has contributed more to this breakthrough than William Kenneth Livingston. Pc/ill MecballiJnlJ. which he published in 1l)-1. "1. was the first major critique of the traditional specificity theon' of pain and marked the beginning of new ideas that evolved to produce the remarkable explosion of research and new forms of treatment that have occurred in the past decade, Livingst(Jn exposed the weaknesses of the tradi- tional theory. \\ith its concept of a straight-through transmis- sion system, and began an exploration of new concepts: the temporal and spatial patterning of input, the importance of summation mechanisms. the dynamics of reverberatory circuits to account for persistent pathological pain states, the importance of the internunCIal puol:, 111 the spinal cord in the gating of input. 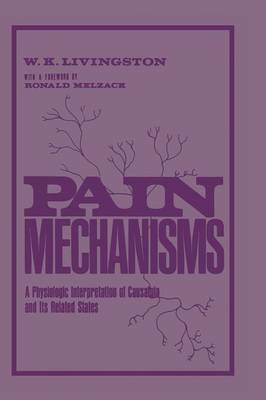 and the usc of anesthetic blocks and stimulation tech- niques as a wa\' of modulating pain. Pi/ill Mec/J,lIli. l1ll \ is as exciting today as it was when it was first published The book \\as so far ahead of its time that few people in 19/j) understood the importance of Livingston's ideas. In historical perspective. It IS astonishing to see that Livingston revealed and illuminated even; major pain problem that con- cerns us today It IS a book that should be read by every serious student of pain lllecharllSl11S in all disciplilles. Its profound in- sights in the psychological.